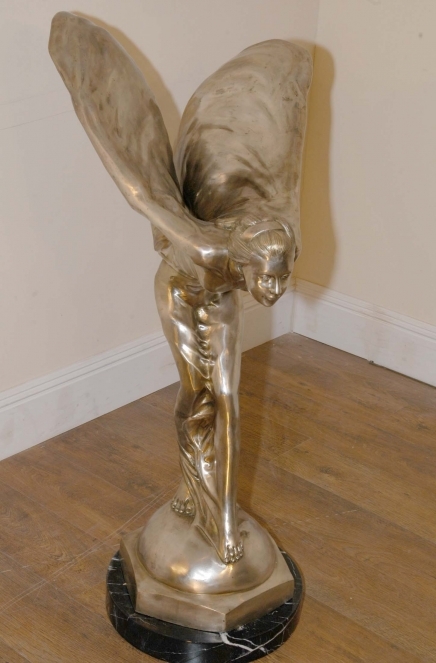 You are viewing a gorgeous bronze casting of the famous Spirit of Ecstasy (on the hood / bonnet of every Rolls Royce motor car) on a marble base. Like every good work of art there is a great story behind its making (see below). The piece is offered in perfect condition and ready for home use right away and would make a great collectors piece for any home or collector. The piece is signed near her foot – please see the close up photo. This is certainly the most attractive and probably the best known motor car mascot in the world. Designed by Charles Robinson Sykes, she has adorned the radiators of Rolls-Royce motor cars since 1911 and concealed a hidden passion. This marvellous mascot was modelled after a woman who had bewitching beauty, intellect and esprit – but not the social status which might have permitted her to marry the man with whom she had fallen in love. This is the story of Eleanor Velasco Thornton, whose liaison with JohnWalter Edward-Scott-Montagu (after 1905 the second Lord Montagu of Beaulieu) was to remain a secret for a decade or more, principally because both partners acted with the utmost discretion. John Scott, heir to his father’s title, was a pioneer of automobilism in England. From 1902 he was editor of the illustrated magazine The Car. Eleanor V Thornton was employed as his secretary. Friends of the pair knew of their close relationship but they were sufficiently understanding as to overlook it. The bronze is offered in very good condition ready for home use right away and we will ship this to anywhere in the world. We bought this from a dealer in London’s Camden Passage. 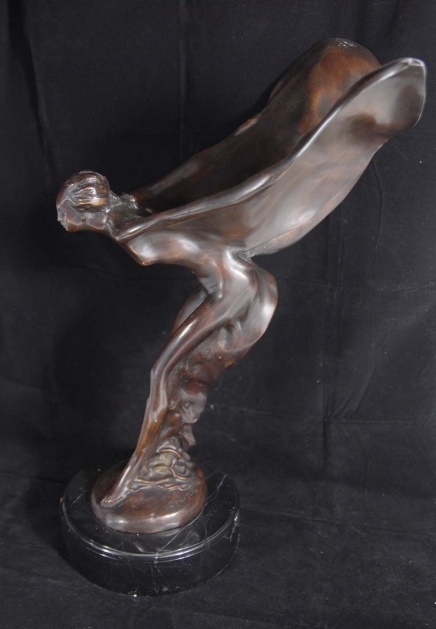 You are viewing an amazing bronze casting of a four foot tall Spirt of Ecstacy, the famous Rolls Royce emblem that sits on the bonnet (or trunk for our American cousins). The piece was originally by Charles Sykes and this is a recast from the original. Like every good work of art there is a great story behind its making (see below). The piece is offered in perfect condition and ready for home use right away and would make a great collectors piece for any collector. She sits firmly on the black marble base which is smooth and chip and flake free. The silvered bronze has a lovely finish and I hope the photos do it some justice. This is certainly the most attractive and probably the best known motor car mascot in the world. Designed by Charles Robinson Sykes, she has adorned the radiators of Rolls-Royce motor cars since 1911 and concealed a hidden passion. This marvellous mascot was modelled after a woman who had bewitching beauty, intellect and esprit – but not the social status which might have permitted her to marry the man with whom she had fallen in love. This is the story of Eleanor Velasco Thornton, whose liaison with JohnWalter Edward-Scott-Montagu (after 1905 the second Lord Montagu of Beaulieu) was to remain a secret for a decade or more, principally because both partners acted with the utmost discretion. John Scott, heir to his father’s title, was a pioneer of automobilism in England. From 1902 he was editor of the illustrated magazine The Car. Eleanor V Thornton was employed as his secretary. Friends of the pair knew of their close relationship but they were sufficiently understanding as to overlook it.